Trevor Lindon, Pavel Bure, Greg Adams, Jiyrki Lumme, Kirk McLean and the list goes on... All under the coaching leadship of Pat Quinn. These were the unsung heros of the 1994 Vancouver Canucks that again, similar to the 82 team, made a surprising run for the Stanley Cup, but this time, came as close as they could have possibly gotten. 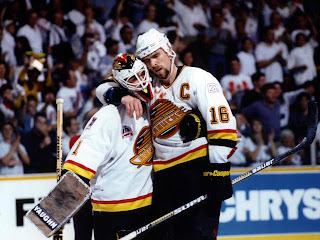 The first round series itself, against the Calgary Flames, ended up producing some of the most memorable moments in Canucks history. After being down 3 games to 1, the Canucks advanced with a game 7 breakaway overtime goal from the Russian Rocket, Pavel Bure (below). After dispatching Calgary, the Dallas Stars and the Toronto Maple Leafs were easier tasks, both eliminated in 5 games. Back in the Stanley Cup Finals for the second time in their history, again another New York team stood in their way (after being beaten by the NY Islanders 12 years earlier) - this time it was the potent Mark Messier-lead New York Rangers and this time around one of the greatest finals of all times would be witnessed. At first glance nobody really gave the Canucks a chance, and after the first 4 games, it was beginning to look like the pundits would be right. The Rangers took a 3-1 game lead but Vancouver would not give up easily, coming back to win the next two and tieing up the series at 3 game a piece. Game 7 would be a heartbreaker for all Canuck fans. Down 3-2 in the third period, Nathan Lafayette's shot off the post with just under 3 minutes to go will forever be remembered (below). 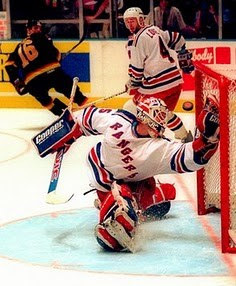 That was as close as Vancouver would come as the Rangers would take the Cup. Meanwhile, back in Vancouver, the end result would bring an unpleasant end to what was a fantastic playoff run. 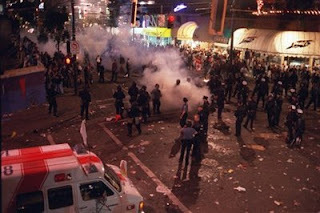 After game 7 was concluded, somewhere between 50,000 to 70,000 individuals converged upon Downtown Vancouver and at the intersection of Robson and Thurlow Street, a riot would ensue leading to nearly 200 hospitalisations and one rioter ending up with permanent brain damage after getting shot in the head with a plastic bullet by police. Thus, what should have been a night of celebration in honour of a great playoff run, in the end, turned ugly on the streets of Vancouver. What has remained, however, are those moments, again, provided by a great generation of players not expected to go as far as they went. 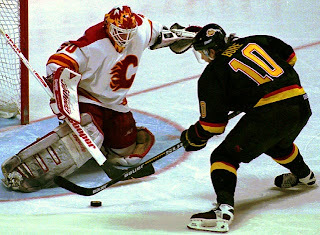 One image in particular would leave its mark: Trevor Lindon and Kirk McLean, two standouts that left it all on the ice on that June 14th of 1994.